A Boutique Digital Communications Firm With a BIG VOICE! Abbe Sparks Media Group is a boutique digital communications firm with one goal in mind: to ignite the sparks for our clients’ initiatives and grab attention! As a boutique digital communications firm headquartered in New York City with an office in Chicago and a virtual team in Denver and Los Angeles, Abbe Sparks Media Group has combined the greatest synergies and resources for clients to utilize in order to capture the attention of appropriate audiences. Through strategic branding, content development, social media marketing and consumer outreach, Abbe Sparks Media Group and subsidiary Abbe Sparks Media Relations have served as the portal for a wide variety of clients through which they communicate their messages. Our specialty lies in the entertainment, cultural arts, start-up technology and non-profit industries and our services are custom tailored to each individual client encompassing a variety of areas. Pride in our clients, passionate about their endeavors, and loving what we do are key factors in our unique approach to communications. This ensures that each client receives private attention and one-of-a-kind strategic planning and creativity. Abbe Sparks Media Group was founded by Abbe Sparks, whose marketing communications experience has varied through the years from Fortune 500 entertainment organizations in New York City to global agencies and boutique firms in Chicago, New York, Denver and San Francisco. She brings her own personal spark and contacts into each project to ensure added value and is 100% involved in every client account. Click here for benefits & fundraisers. 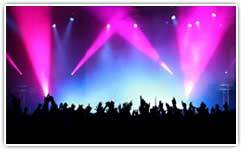 Click here for upcoming entertainment events. Click here to find news on products we recommend. Click here for websites worth seeing!